A few links to sites, images and texts that have caught our attention over the past week or so. A Valentine’s day redesign is being planned for Harper’s Bazaar. Robin Derrick, former creative director of British Vogue, is a consultant. Terry Richardson snapped the cover (top) which features Gwyneth Paltrow. The Museum of Forgotten Art Supplies includes includes a series of in-depth ‘Unforgettable Art Supply Moments’. Thanks to Hilly Beavan for this link. Below: Godfrey Reggio’s movie Koyaanisqatsi sped up 1552 per cent to last just five minutes (but without Philip Glass’s score). By Wyatt Hodgson. Eye editor John L. Walters made a guest appearance discussing recent magazines (including Random Spectacular, below) with Monocle founder Tyler Brûlé and host Gillian Dobias on last Saturday’s The Review on the Monocle24 internet radio station. 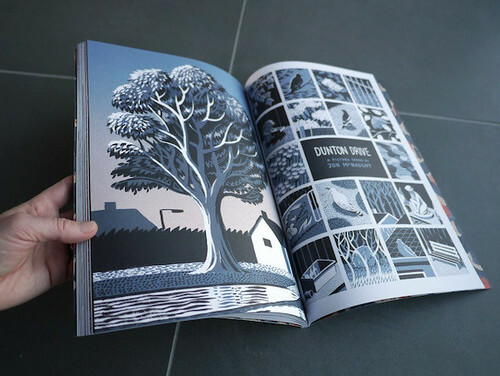 Above: spread by Jon McNaught from Random Spectacular.